Fireworks were first documented in 7th century China as a technique to ward off evil spirits because of the loud sounds they create (Wikipedia-Fireworks). Fourteen centuries later, fireworks have become synonymous with Independence Day celebration all across the United States. While beautiful to watch, they are just as fun to photograph. And with the correct camera settings, capturing the pyrotechnic displays may be easier than you think! Below are my tips and tricks for photographing these colorful sky-bombs. This tutorial is geared towards DSLR cameras, but many of these tips/settings can be used with a point-and-shoot camera with the ability to shoot in manual mode. Camera: Whatever camera your shooting with. If you’re using a point-and-shoot, you’ll want to get familiar with using the manual setting. Many point-and-shots also have “firework” presets. If you’re camera has one of these, I would assume this setting would be sufficient if you have a tripod to set your camera on. Remote trigger: Having a remote to trigger the shutter, or a cable release, makes the process much easier and is recommended. Not only is it more comfortable to trigger the shutter, you won’t be imparting any movement into your camera and ensure sharp images. If a remote or cable release isn’t a possibility, use your camera’s timer. You can still use the shutter button, but the extra few seconds will cause the vibrations to cease before the shutter opens. 1. Manual Mode: Shoot in manual mode and in RAW format if you have the capabilities to process them. Otherwise JPEG will suffice. 2. Shutter speed: Generally I shoot 8-15 second long exposures. That said, feel free to experiment with even longer speeds to capture more “bombs bursting in air” in one frame. The 8+ second long shutter speed ensures you capture “full” fireworks (from initial launch until the firework fades). In darker and rural areas, longer shutter speeds will be needed if there is any hope of capturing foreground detail. 3. Aperture: Typically I shoot between f/8-f/14. Fireworks burn bright and the closed down aperture helps keep color & detail in the really brighter areas of the firework. The aperture is the key setting for controlling the brightness of the fireworks. While the above notes on my settings are general suggestions on where to start, your shutter speed and aperture must work in concert with one another to compensate for the change in light entering your camera. When photographing fireworks you’re dealing with two different exposures – The exposure of the landscape/ambient light and the exposure of the firework itself. In this case your aperture controls the intensity of the firework’s flash, and your shutter speed controls the ambient light of the scene. For example, say I’m photographing a night landscape without fireworks at 5-seconds and f/5 and it looks great. If I shoot the same scene with the same settings while a firework explodes, the landscape might still look well exposed but you’ll lose all the color and detail in the firework – they’ll be blown out highlights. So how do you fix this? First, you need to close down your aperture to lessen the amount of light coming in during the firework, say f/11. However, if you only close down your aperture and don’t extend your shutter speed, the next firework you catch may look great, but your foreground/landscape will be dark. So in practice, the firework’s bright intensity needs to be choked down by a smaller aperture to preserve the details of the explosion itself. While the longer exposure will allow your sensor more time to gather the now lessened ambient light of the scene your shooting. 4. ISO: Keep it low – usually under 200. Long exposures inherently add noise and I prefer to start off with the least amount of noise possible. 5. Focus: Manually set your focus to infinity. Manual focus ensures your shutter releases instantly every time without having to re-focus. If you’re using a point-and-shoot, you should be able to choose an infinity focus setting in your camera’s focus menu. With that said take a few test shots and check the focus by zooming into the image on your LCD screen – Make adjustments if necessary. Nothing worse than thinking you have your focus set only to get home and realize it was slightly off! 2. Don’t just wait to see the firework before you release the shutter, listen for it. Despite all the booms, cracks, and fizzles you hear while watching fireworks, you can also usually hear the unmistakable “thud” of the mortars launching from their tubes. In general, the louder the thud, the higher the mortar will go, and the bigger the firework will be. So fire the shutter is when you hear a thud – especially the louder ones! To my knowledge, most fireworks don’t climb for more than 3-4 seconds. If you launch at the thud, you should be able to capture any trailing exhaust, as well as the full “bloom” of the firework with an 8-10 second exposure. *This is especially true If you’re trying to capture amateur fireworks as I usually do. 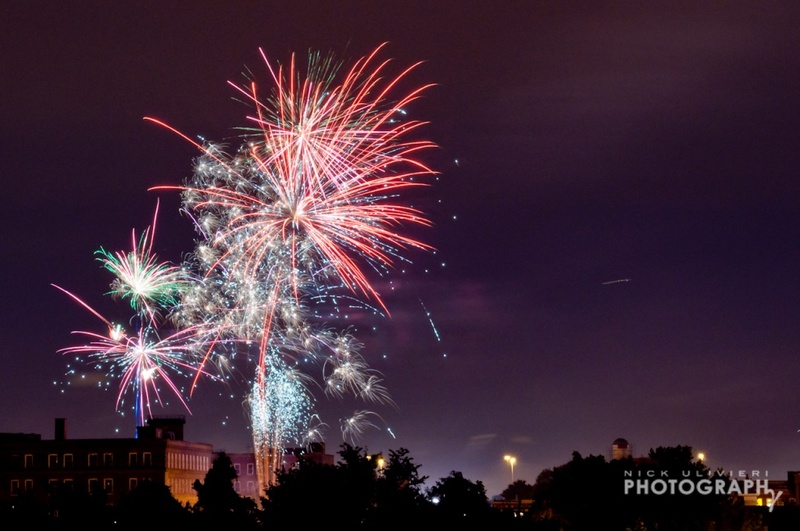 The amateur fireworks won’t be on a strict timing schedule so you may end up with a ton of firework-less shots if you’re snapping away without listening for the “thud”. Good luck and happy shooting this upcoming Independence Day! Get Monthly Access to What I've Been Up To. © 2019 Nick Ulivieri Photography in Chicago, IL.